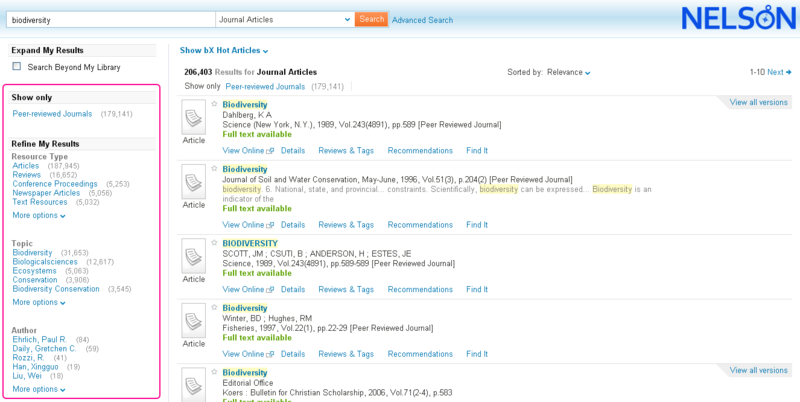 FAQ: How can I use NELSON to find journals and journal articles? While researchers are often best served by accessing Library and Learning Services’ electronic journal collections directly (via our A-Z list), our research discovery tool NELSON can be a quick and convenient way to find articles and journals online. Read on for a short guide. When you use advanced search the form will stay open at the top of the screen, allowing you to refine your results. Facets are simply links you can click to apply various filters to your results. The options given are dynamically generated from (and therefore relevant to) the search results. For all facets, the number after the link shows how many results will be returned when the facet is applied. You can combine either of the above with any of the other facets, such as Author, Publication Date and Journal Title, making facets a fast and efficient way to refine your search. You may be able to request such articles via interlibrary loan. While NELSON works well as a flexible all-in-one service for quick access to the library’s electronic holdings, direct access to journals databases is the most comprehensive search strategy for researchers. The Journals and Indexes A-Z list provides details and direct links for over 100 databases, where you can often find detailed and dedicated search tools, such as the ability to search the full text of articles. 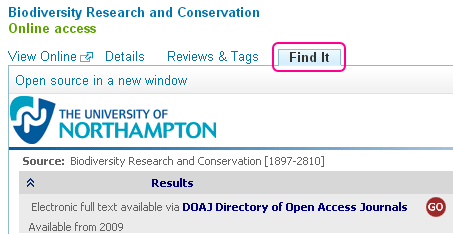 You can also use the library’s Find My Reference tool for advanced journal title and article searches, particularly if you have specific metadata such as a DOI (Digital Object Identifier)- while you can search for DOIs and journal ISSNs on NELSON, Find My Reference is a more focused and robust solution. Posted on October 8, 2013, in Library and tagged FAQs, howto, journals, NELSON, Online resources. Bookmark the permalink. Leave a comment.